What is the most common vowel sound in the English language? If you said long or short /e/, you are wrong. The most common vowel letter is ‘e’ but the most common vowel sound is the sound /uh/ (like the sound someone makes when trying to think of a word). It sounds like the short /u/ sound, but is softer and weaker. It is the only speech sound with its own special name: schwa. 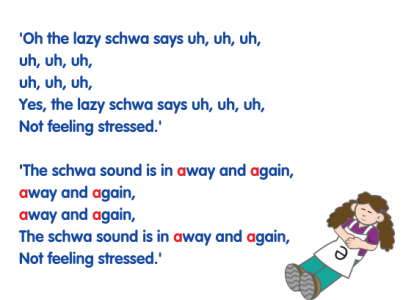 It can be a cause of confusion and frustration in spelling and reading for a student so, in this blog, I’ll give you a simple way to explain it and some tips for helping students to decode and encode words containing a schwa. The English language is stress-timed. In an English sentence, the words that communicate the most important parts of a message (the nouns, main verbs, adjectives and adverbs) are stressed. e.g. Function words (auxiliary verbs, pronouns, articles, conjunctions and prepositions) are not usually stressed, in order to maintain a regular rhythm in the language. For the same reason, words of more than one syllable have both stressed (strong) and unstressed (weak) syllables. For example, in the word: the second syllable is stressed and, consequently, louder. We record this with a stress mark (ˊ) after/pointing to the stressed syllable. Unstressed words and syllables are usually said faster and at a lower volume than stressed words or syllables. As a result, the vowel sound in an unstressed word or syllable can lose its purity. In Level 1 of Phonics Hero (sign up for a free Teacher Account here), students learn the tricky word ‘the‘, and in Level 2 they learn ‘a‘. These words are articles, so they are unaccented, and the unaccented vowel in each of these words sounds like /uh/. We don’t hear the expected ‘long e’ or ‘long a’ sound. Schwa is the most common vowel sound in the English language because most unstressed vowels are pronounced as a schwa. The word ‘schwa’ comes from Hebrew and children usually enjoy saying it. Schwa is related to the short vowel sounds because it can be spelled by any of them, including the semi-vowel ‘y’. I like to refer to it as the ‘lazy’ vowel cousin. You hardly open your mouth to create this vowel sound. The tongue, the lips and the jaw are relaxed. The schwa sound is represented by a /Ə/ in the Phonetic Alphabet (like an upside down ‘e’ or an ‘e’ too lazy to sit up!) It takes very little time to say in a word – so little that we, on occasion, lazily skip right over it when saying a word (e.g. the second ‘o’ in ‘chocolate’ or the first ‘e’ in ‘different’) or don’t even represent it when spelling (e.g. the vowel sound between ‘-th-‘ and ‘-m’ in ‘rhythm’). A schwa can replace an r-controlled vowel like /er/ when it makes up an unstressed syllable, e.g. ‘letter’. Australians are renowned for making this replacement. Listen to an Australian say: You are unlikely to hear the /r/ at the end of the three red words. Australian English does not use /r/ before a pause or another consonant so be particularly aware of this when teaching Phonics Hero, Part 3, Level 20 (ir, er, ear, ur, or). Schwa usage varies greatly between dialects. Australian English speakers often put schwas in places where British and American speakers do not. 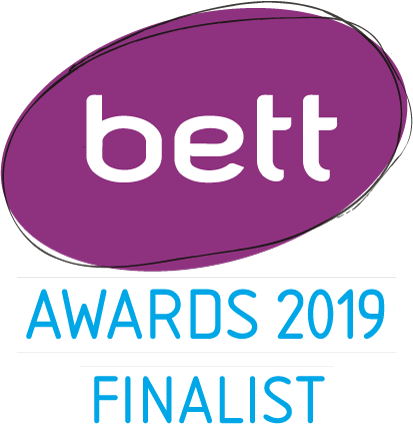 I believe it is particularly important to explicitly teach EALD students, and students struggling with learning difficulties in reading and spelling, the schwa feature of the English language. Introduce it once they are reading and writing two-syllable words. These are included in Part 2 of Phonics Hero, The Advanced Code, and, of course, there are many in Part 3. 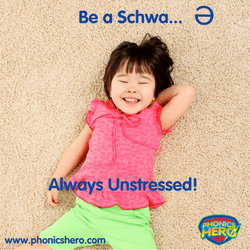 You may have to explain it earlier if students struggle with tricky words containing schwa in Part 1 such as ‘the’, ‘a’, ‘today’, ‘of’, ‘away’. Have students say a sentence, tapping their leg as they say stressed words. Have them mark the stressed words in written sentences with a stress mark (ˊ). Awareness of this will become very useful in poetry study in later years. Talk about the types of words that are stressed and the types of words that are not stressed. Have students write the schwa symbol over the vowel in the unstressed words they identified. Substitute other two-syllable words for ‘away’ and ‘again’ for other verses. Teach students to try the schwa sound when a long or short vowel doesn’t sound right in a word being read. e.g. ‘I’m having a sal-ad’. After decoding the word with a ‘robot’ voice (each syllable evenly stressed), have the student place stress on one syllable (sal’) then pronounce the other with a schwa for the vowel (Əd). If this does not sound right, stress should be shifted to the next syllable. (a) When learning the spelling of words with a schwa, encourage students to use their ‘spelling voice’. They should pronounce the unstressed vowel/syllable the way it would be pronounced if the vowel sound was stressed, with a pure sound (e.g. A, thE, SUPport). (b) Teach students to associate base words containing a schwa with their derivatives especially when the derivative has an accented syllable in which the pure vowel sound is clearly heard e.g. president-preside, human-humanity, definition-define. (c) Teach students to use memory joggers for words that don’t have derivatives e.g. ‘cotton on to an idea’. The chances are that, like me, you managed to learn to read and spell without being explicitly taught about schwa. Schwa remains, however, an important part of the English code and all of us will have students who need to understand it in order to fully ‘crack’ that code and make maximum progress in reading and writing. Great article on a topic I never see written about! Thank you! I’m sharing it out and putting a link for it inside my Reading Simplified Academy. I agree that it is essential to teach teachers and students about the schwa sound. However, it is a difficult concept for those learning to understand. As a speech language pathologist, we are taught phonetic transcription at university as it is an essential aspect of assessing and treating children with speech sound disorders. It is also an important aspect of learning to spell English words due to the effect of stressed/unstressed syllables in English. It is difficult to teach as it requires very advanced phonemic awareness skills requiring the ability to discern different vowels sounds within the context of di- or mutlisyllabic words.So I commend you in your efforts at educating teachers. However, it is very important that the concept is taught with the correct examples. Advice from an experienced speech/language pathologist is advisable when utilizing a speech to print approach to written English language learning. Just this week, I had a public school LST whose school has embraced systematic synthetic phonics express concern about PD that was provided recently to the teachers at the school by an expert teacher regarding phonics which contained inaccurate examples of the use of the schwa, eg that the ”our” in ”colour” is a schwa sound. Therefore, for accuracy, I just wanted to correct some of your examples. the ”a” at the beginning of the words ”about, along, aside, again, away, etc” is actually the short ”u” sound (upside-down /v/ in phonetic transcription) the same as the sound in ”up, cup”. This is also the sound with /r/ controlled vowels at the end of words (eg winter, doctor, dollar) which is why children learning to spell usually spell those words as ”wintu, doctu, dollu”. I always initially teach children that the short ”u” sound is usually spelt with an ”a” at the beginning, ”u” in the middle and ”er” at the end of words. Also the ”a” in the suffix ”age” (eg damage) is a short ”i” sound and the ”u” in ”upon” is also a short ”u” vowel sound. As Louisa Moats stated when she was in Australia 4 years ago and presented for Learning Difficulties Australia, teachers and even speech pathologists are notoriously bad at counting/identifying sounds in words accurately. Louisa Moats is a highly respected researcher and author and is quite correct in saying that both teachers and speech pathologists sometimes make errors in identifying and representing sounds. If you care to look up the word ‘about’ in any of the following dictionaries, you will see that the phonetic transcription of the first, unaccented vowel sound is a schwa: Oxford English Dictionary, Cambridge Dictionary, Collins Dictionary, Macmillan Dictionary, Merriam-Webster Dictionary. The same phonetic transcription is seen in these dictionaries for the initial sound in the words ‘along’, ‘around’ etc. If all of these dictionaries are correct, then you are in error when teaching your clients that the initial sound in these words is the short ‘u’ sound represented by an upside-down ‘v’. When you look up the word ‘colour’ in any dictionary, you will also see the ‘our’ represented by a schwa in phonetic transcription, followed by an r, sometimes reduced in size or in brackets, as in some dialects the ‘r’ is indeed pronounced, while in others it is not. It is the first ‘o’ that is representing the short u sound and is represented by an upside down ‘v’. You will see the same representation of ‘er’ in ‘winter’, ‘or’ in ‘doctor’ etc. The first sound in ‘upon’ is represented phonetically in dictionaries by a schwa. You are right in saying that the second ‘a’ in ‘damage’ is not represented by a schwa, but rather by an ‘i’, so that example has been removed from the list in this blog. Constructive feedback is appreciated.